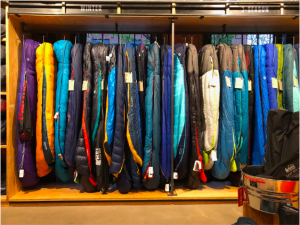 Whether you are planning on sleeping in your truck to catch that first chairlift, doing some late fall or winter camping, ski touring, mountaineering, or even snow caving, picking a good winter sleeping bag can be tough. There are a ton of options, and prices, and shapes, and features. Just going to REI can be overwhelming, to say the least. So, I am going to break down what you need to look for exactly in order of importance. This gets listed first because everyone has a budget when it comes to buying gear. 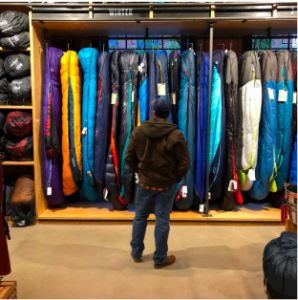 You should know, however, that when looking at real winter sleeping bags you are looking at a $200 or higher purchase and really more in the realm of $450. I typically buy last season’s bags because they are always on sale and honestly the newest bag usually doesn’t have all that many new features. 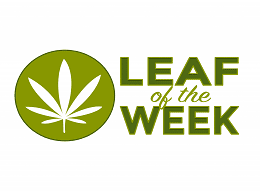 If you get a good bag it will last you 3 to 5 years at least and by that time there should be some new features you may want to look into. Insulation is a very important feature of your sleeping bag and typically the more loft or fill in a bag the warmer it will keep you. 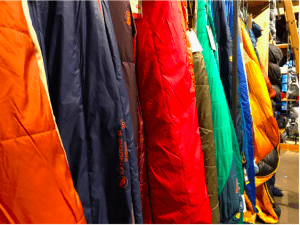 There are 2 main types of insulation to choose from when selecting a sleeping bag. Goose Feather Down – This option is typically more expensive and it will not insulate you well if it gets wet. That is about all the downsides there are to down. 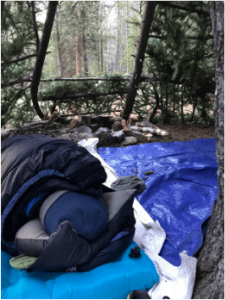 Down sleeping bags are typically warmer for their weight, more durable, more compressible, and with a dry treatment to the down, it will still keep you very warm when wet. If you go this route it is important to do some research on the different ways down can be treated or protected from moisture. Different methods yield different results. Fill rating can be explained simply as the lower the fill rating the heavier the bag for the degree rating. So, a 600 – 0-degree fill bag will be just as warm as an 800 – 0-degree fill bag, but the 800 fill option will weigh much less. Synthetic – Tends to be chosen more than down for the simple fact that it is without a doubt always cheaper. Polyester is usually what synthetic bags are filled with and while it does keep you warm when wet, it does not have a great weight to warmth ratio. The other plus to a synthetic sleeping bag is that they are hypoallergenic so there is no risk of an allergic reaction. They don’t pack down small and they weigh more so unless you are car camping or very worried about where your down feathers came from, I would stay away from synthetic. Let’s be clear here if you are looking at winter sleeping bags we are talking 0-degree bags and below. 20 degree bags are great for spring and fall, but if you plan on sleeping while there is snow on the ground you are going to want a 0-degree bag. The rating of each bag is meant to state the lowest temperature it will keep an average human comfortable to. All temperature ratings are also assuming that an average human camper is wearing a base layer and is on top of a sleeping pad. I find this a little vague so I did some digging and here is what I have found out. First, if you are typically colder than your friends or a smaller than average sized human then I would consider a lower bag temperature rating. A “base layer” in winter terms also includes a beanie and socks and honestly sometimes a puffy jacket. I would always be prepared with some extra layering you can wear in your bag when winter camping. Shape plays a critical role in warmth retention of a winter sleeping bag. You will find that almost all decent winter sleeping bags will have a mummy shape. You may also discover you are claustrophobic as soon as you get in one of those mummy bags. Good news, you don’t want a shape that is to tight on you because if you are compressing any of the insulation while sleeping in a bag you will lower the insulation qualities of that area. You also don’t want a bag that is too roomy because that dead space between you and the bag doesn’t insulate very well. It is best to determine which bags fit you well by heading into your local gear shop and hopping in every winter bag you can find. Try bringing along things you might wear in the bag or have with you when using the bag. Consider changing in it as well as having to bring things like water, your clothes for the next day, batteries, cameras, flashlights, and possibly your boots inside with you. Trust me, when you wake up to below 20-degree weather you are going to be glad all of your clothing for the day was inside your warm sleeping bag so you can change into them before venturing out into the cold. When you do go try out bags check for things like zippers snagging because if it snags on a brand new bag you can be sure it will out in the field. Also roll around in the bag, adjust yourself as you would while sleeping to ensure it is not too tight and not too loose. Check for little annoying things like a hood that doesn’t quite fit you or a piece of velcro that rubs against your skin and so on. The weight of your winter sleeping bag will most likely be much more than most if not all of the other sleeping bags you own. More insulation means more weight. It is important here to determine the things you will do with that winter sleeping bag as weight might be a huge factor. Backpacking, mountaineering, or ski touring? You want as light and warm of a bag that you can afford, period. Keep in mind too that winter activities require more equipment that adds onto whatever your summer pack weight was. Planning on car camping and maybe hiking in just a little way before setting up camp or digging in for a snow cave? Then you can probably sacrifice some weight for warmth and price. These are things like the zipper location, right or left? Draft collars around the hood. That brings me to another point, ALWAYS buy a winter sleeping bag with a hood. You lose most of your heat through your head, you want a hood, period. Zipper baffles to keep cold air and water from seeping in. Does it have a stash pocket to keep important items close at hand? Does it come with a stuff sack and storage sack? Finally, the least important item when deciding which winter sleeping bag to buy, brand. Don’t get me wrong certain brands do certain things in the sleeping bag game very well. However, in today’s information age, if you make an inferior product you just don’t last. Be sure to read reviews and use the above-mentioned features to narrow down your search and then maybe consider picking one out of 3 based on the brand if you are really loyal to a particular one. Honestly these days all the major brands make top of the line equipment and most have great warranties on them.